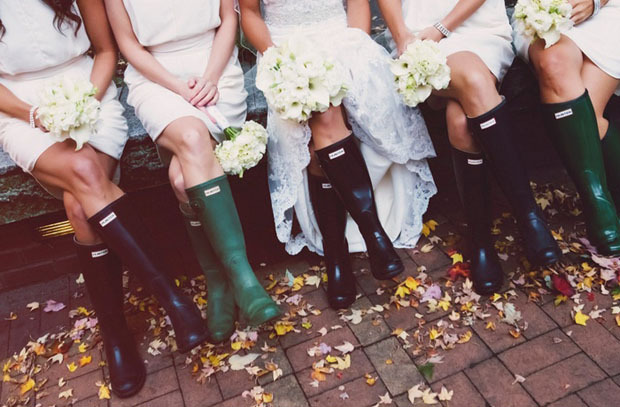 Putting your own little stamp on your wedding is part of the fun – here’s 9 sweet ways to give your wedding that personal touch! 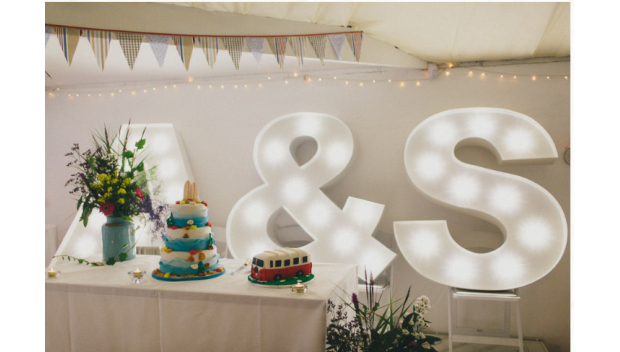 These giant marquee lights would look cool loitering just about anywhere else in your wedding venue but we love the idea of making your grand entrance as newlyweds with these enchanting lights twinkling away as a backdrop! A great way to add some extra wow factor to your wedding space – and they’d be the perfect spot to pose for some fun wedding snaps. For more information on Lovin Letters service click here. Another idea we love and that will save you a few quid is making your own wine. 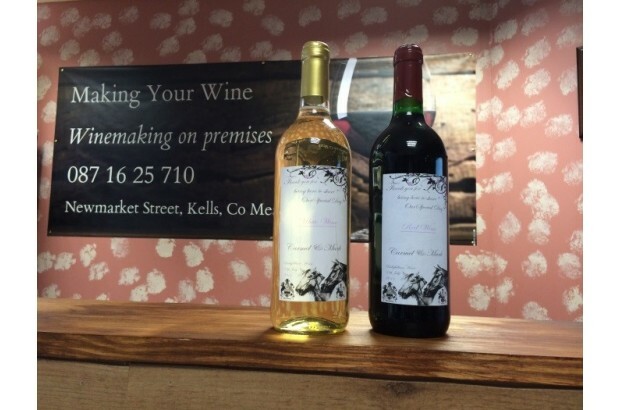 Making Your Wine is a company based in Meath, where you can brew your own vino over several weeks (it takes at least 4 weeks to make it and an additional 3 weeks to rest in the bottle). There’s no chemicals (no headache the morning after), you get your very own personalised labels and it goes without saying that it would be an entertaining few weeks. Keep things even more personal at your wedding by giving everyone their own special chalice to drink from for the evening – just add chalkboard labels to mason jars for a cheap and cheerful favour idea. Guestbooks are a great way of making your wedding that bit more personal – sifting through messages from those that celebrated this special day with you will be something to look forward to post wedding curled up on the couch, as you count down the days to your wedding photographs. We love the idea of teaming it with a photobooth so that you can have some snaps of wedding shenanigans to pour over too. 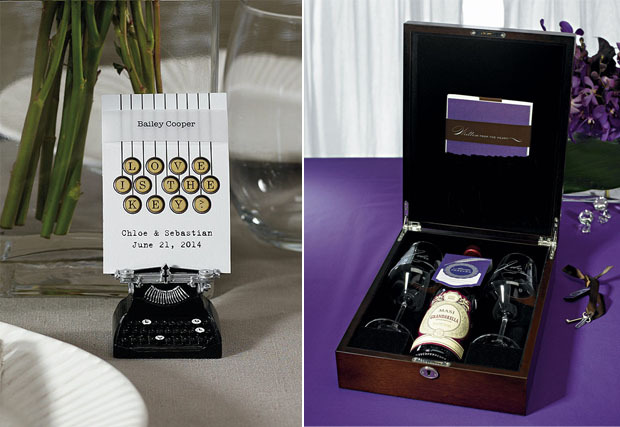 But you don’t have to opt for a traditional guestbook, there are lots of innovative ways to record who was at your wedding. 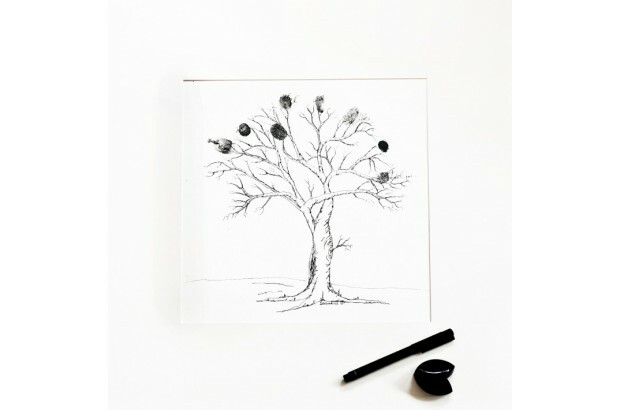 One of our favourite and a more unusual choice is the fingerprint tree. We love the idea of having a piece of personalised art to remind you of this hugely special occasion and the fact that those that shared your special day helped you make it. We love our signs here at weddingsonline and when we spot a personalised version with the couples name in there we’re even more besotted. The two examples above are handcrafted but with tastings, trials and the zillion other weddings tasks driving you round the bend, it’s understandable you might not have a spare weekend to dedicate to woodwork. 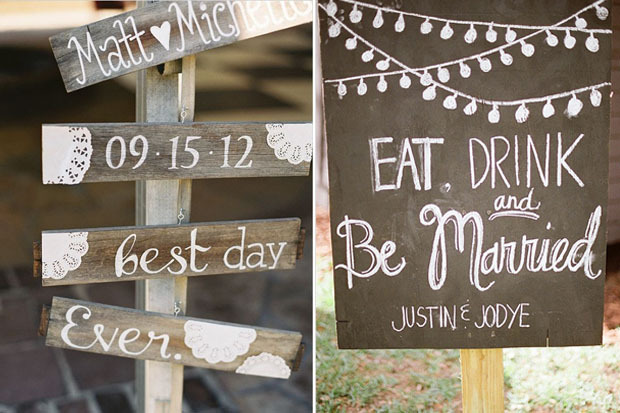 Which is why we love that BigDaySigns can give you that personalised look without all the chalk, paint and general heartache (we’ve a particular soft spot for their ‘here come the bride’ signs). They’ve lots of custom made signage to choose from – to browse their gorgeous range click here. Caricature cake toppers are not a new trend but they’re one that tugs at many a bride’s heartstrings. 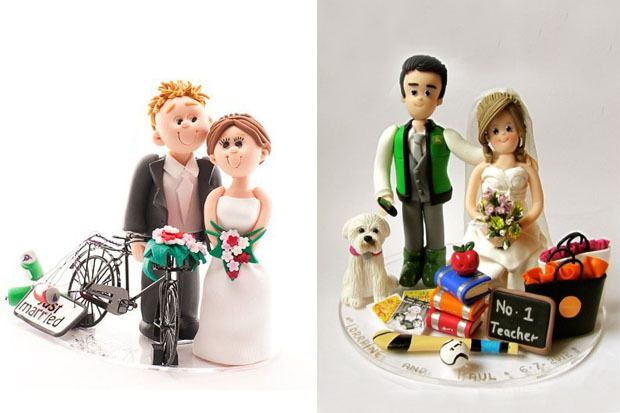 What’s not to love about a mini figure just like you and your OH sitting atop your wedding cake – the great thing about these cake toppers is that they can be just like you and your beloved from the hurl the hubby won’t put down to shopping bags you’ve become quite accustomed to by your side. You can even add in Spot the dog if he’s a part of your happy little family. To browse wedding cake top suppliers, click here. Putting your stamp on your wedding is all part of the fun – and one of the quickest and cheapest ways to to do this is through your table names. If you’re not a fan of plain old numbers, you can use practically anything to mark out one table from the other – think footie teams, favourite books or movies, bands or songs – you can even use childhood pictures, relationship milestones or anything else that means something to you and that new special person in your life. 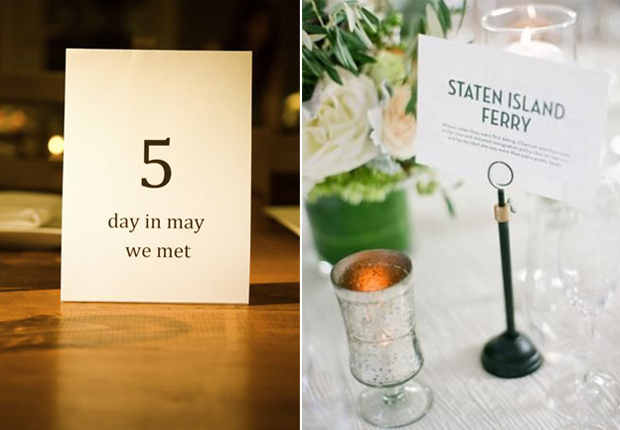 For more inspiring ideas, check out our article on the most inspiring table name ideas! 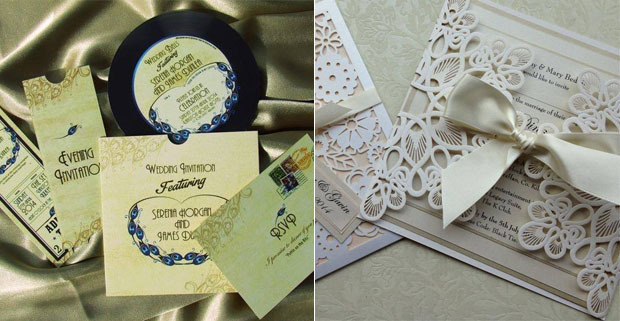 We say it time and time again, but your stationery is a great way of setting the tone and giving your guests an idea of what type of wedding you’re having, whether it be an elegant black tie affair (Helen’s Paperie have lots of chic and luxurious stationery options perfect for an elegant wedding bash) or vintage tea party. For the music lovers among you, feast you eyes on this innovative stationery suite from Share the Day Invitations – their 20s inspired Jazz wedding collection includes adorable mini record invites, evening invites styled as admission tickets and vintage style postcards for RSVPing.We also love these super cute wedding maps lovingly created by Kerry Harvey (showcased in main image), a fun way to show your guests where the party is at. Saying those two precious words to your other half will be one of the highlights (if not the highlight) of your wedding day so if you’re looking for a romantic and sentimental way to remember this special part of the day, you might like the idea of a love letter exchange. The idea is to write a heartfelt note to your OH summing up how you’re feeling, you then lock them away for safekeeping with a bottle of wine and crack it open on an anniversary so you can relive these happy emotions. The Love letter ceremony box is available from the weddingsonline shop but there are lots of other personalised décor ideas for your ceremony too from sand ceremony kits with photographs to personalised candles (be sure to check out Candles Advanced and V & S Handmade Candles – both companies offer beautiful designs which can be personalised with the couples names to add an extra special touch to the ceremony) or if you’re looking for a charming touch for your reception, these wee typewriters are perfect for displaying a heartfelt message. 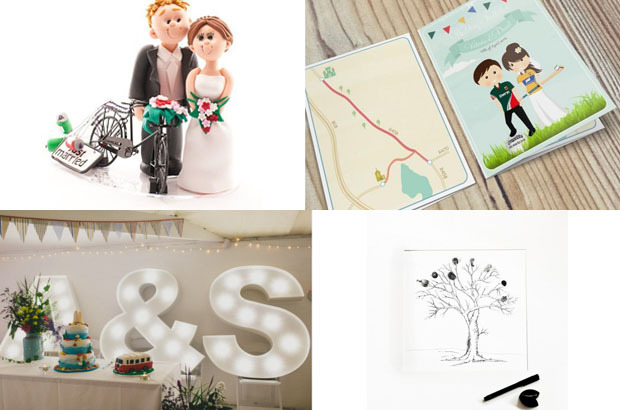 To shop all things personalised at the weddingsonline shop click here! If you’re after a favour idea that stands the test of time, you can’t get more personal that getting a live caricature artist to draw funny little sketches of you and your guests. It acts a great ice breaker, will get a lots of laughs and can be the perfect way to entertain guests while you’re waiting for the band to get started. 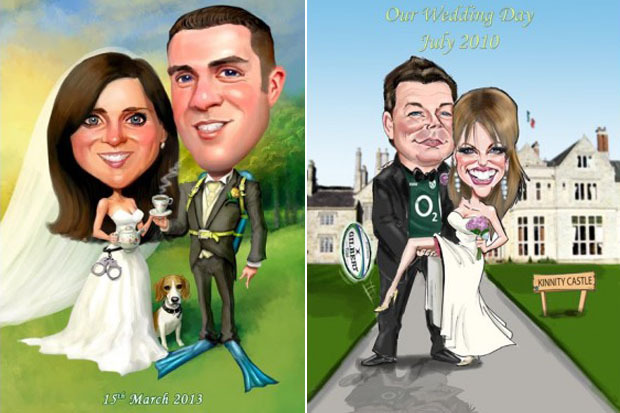 It’s also a truly personal keepsake they’ll have forever to remember your wedding day by and you can bet your wedding cake it will either be hanging in pride of place in their home or will make it as a Facebook profiler.To browse all live caricature artists click here. Great articles, links to companies and ideas. Love your site espically as d day looms !